A while ago I made a post about my eczema-ridden, sensitive skin. Well, because of my eczema I have a hard time finding a shampoo that won’t irritate my scalp. I told you that I was on a pursuit to find the ultimate shampoo, and I found it you guys! Wen by Chaz Dean is a game changer for shampoos. How did I not know about this sooner? It’s all thanks to my girl crush and hair inspiration, Claire Marshall. On some of her videos about her hair (over on her youtube channel) she mentioned Wen. Hmmm… So naturally I had to give it a go. There’s nothing I don’t like about this product—only that I already used up my first bottle and need more. The directions on how to use it are on the back of the bottle. I know what you are thinking: ‘Directions for shampoo? Really?’ It sounds ridiculous but I had to read them. It was my first time using a shampoo that didn’t lather, so I wanted to make sure I was doing it right! The texture was so smooth and the shampoo seemed to cool while it was sitting. You know that cooling effect that some face washes have? Ya, imagine that on your scalp. And don’t get me started on the sent. Oh, the smell of lavender all around me. Talk about pampering yourself every time you wash your hair! They have loads of other scents, too. I’m just a lavender lover. The scent immediately calms me and puts me in a zen mode. What’s the point in thinking about finals and essays while you’re in a whole other world? Talk about a bubble buster. Now time for the comparison. Since my bottle has run out I’ve gone to Herbal Essences hydrating shampoo, the one in the blue bottle, to see how I react to that shampoo. The difference in my hair is shocking. Immediately my hair lost its shine, started getting frizzy and dry. Not to mention the color of my hair seems to be duller. 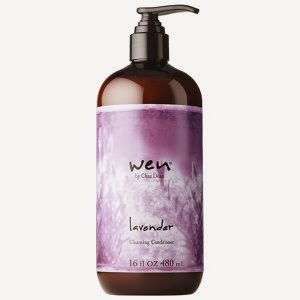 Wen is a product that I think is worth trying if you have a sensitive scalp like me. And if you have already tried it out I’d like to know your ideas on the product so comment below! ...I think I purchased another bottle while writing this post! xBe Lovely. Be Strong. Be you.